General turn around time is three to four weeks with the exception of toys, which I try to ship in two weeks or less. If you want rush service, it is available on most items. Please message me about this special service. Rush service is available only in the US. "PUT A NAME ON IT"! 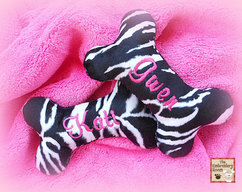 ONLY FOR THE "SPOILED" PET IN YOUR LIFE, PERSONALIZED DOG TOYS! 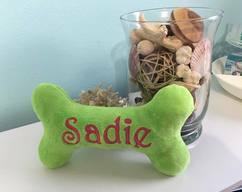 Your pampered pooch will absolutely LOVE these small sized squeaky toys personalized with their name! This toy is approximately 5.5 inches long by 3.5 inches wide at the end. The perfect size for smaller mouths. 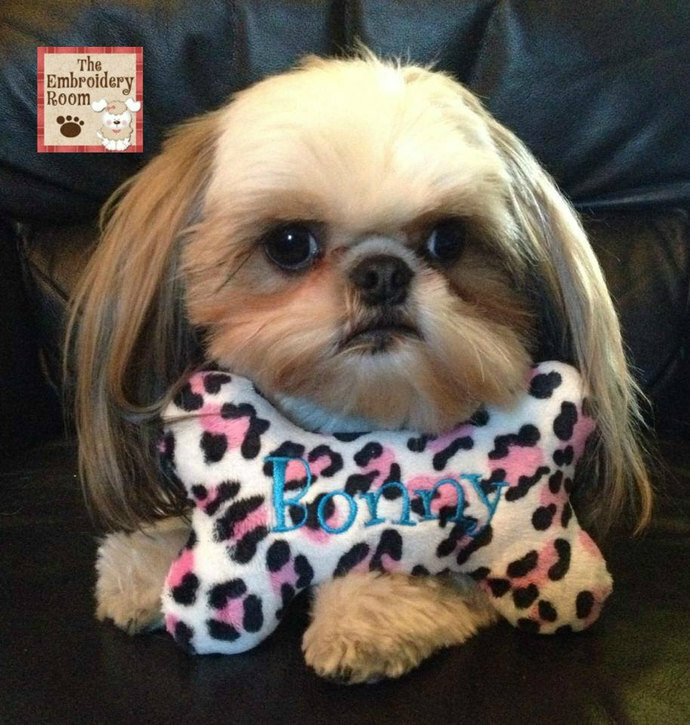 Your large breed pampered pooch will absolutely LOVE these larger sized squeaky toys personalized with their name! This toy is approximately 9.5 inches long by 6 inches wide at the end. 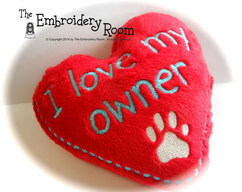 The are the perfect size for large dogs such as Labs, Boxers, and Shepherds. Each toy is made from premium grade soft Minky type fabrics. I hand stuff each one with premium poly fill and a KONG squeaky inside. Don't want the squeaky noise inside? That's not a problem. Just leave me a note when you order to leave it out. 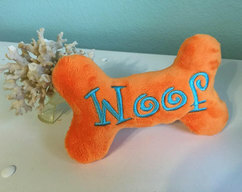 Shown here embroidered with the "YIPEE" font and blue thread. Each toy is triple stitched for durability. The opening is ladder stitched closed. Although I'm confident in the quality, some dogs are harder on their toys than others so please supervise your pets with toys at all times. NO TOY IS INDESTRUCTIBLE!!! Large sizes are also available in this shop in various colors. Feel free to make custom order requests not shown here.